Where can you watch wild birds in Rocky Mountain National Park? Everyone associates elk with wildlife watching in Rocky Mountain National Park, but birders and summer visitors should know that Rocky Mountain National Park is designated as a national “Important Bird Area” with over 200 different birds spotted – some very rare! Birding Life-List — let’s get started! From geese to grouse, owls to woodpeckers, hummingbirds, bluebirds, woodpeckers, and warblers —you can see them all in Rocky Mountain National Park. 280 species have been reported in the Park! 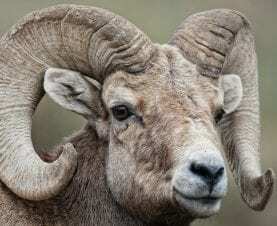 Around Estes Park and Lake Estes, 230 species have been identified, some considered exotics in Colorado. 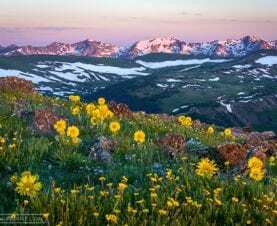 With three life zones (montane, subalpine, and alpine) covering elevations from 7,700 ft to 14,255 ft and an area of over 264,000 acres there is no better, more accessible place to find and watch the wild birds of the Rocky Mountains. 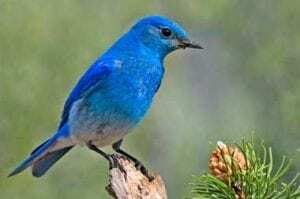 Starting with Mountain Bluebirds who arrive in early March, shorebirds stop at area lakes during their migration in April, and mountain breeders arrive in April and May to set up at their preferred breeding spots. Warbler migration peaks in May, and summer only birds like beautiful Western Tanagers return by June. Fall migrants start appearing in mid-August, and summer-only species begin to leave by late August. The resident mountain birds like chickadees, nuthatches, and jays hold down the fort during winter, and Christmas bird counts usually only identify 40-50 species who remain during winter. 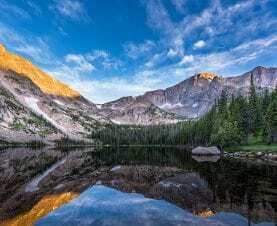 Endovalley is one of the best birding spots in Rocky Mountain National Park because it has about every mountain bird habitat except alpine tundra. It’s all accessible from the road and a great place to spot spring migrants. On the way to Endovalley from the Fall River Park Entrance, visit Sheep Lakes in spring and early summer for waterfowl, and watch for raptors over the meadows of Horseshoe Park. Birding areas near Endovalley are Old Fall River Road, Little Horseshoe Park, and Upper Aspenglen. Moraine Park is another great birding area in the Park, along the Cub Lake Trail, The Fern Lake Trail, and the open meadows and riparian habitat. If you’re camping, the Moraine Park Campground is the best for birders (reservations required), with lots of birds in camp and easy hikes to the trails of Moraine Park. Lily Lake wetland on the south shore, and Wild Basin beaver ponds are accessed from Hwy 7 on the SE corner of the Park. The wetland is a great place to visit during spring migration. In Wild Basin you can take a short 2.7 mile hike to Ouzel Falls (Ouzel is another name for the American Dipper). Finally, Trail Ridge Road takes you up into the tundra to look for high elevation birds like Ptarmigan or Rosy Finch. It’s a scenic day trip with spectacular mountain views and tiny tundra wildflowers in late July and August. In spring, the Rocky Mountain Conservancy and Park Naturalists schedule classes and birdwalks in the Park where you can learn from experts and join them in the field. The grounds of the YMCA of the Rockies are one of the better birding areas outside the Park. The YMCA has lots of family activities and cabins for rent, so it’s a great place for birders to stay. Lake Estes has year-round birding because it’s at least partially open water all year. At its northwest corner between the lake and the Big Thompson River is a small area of willows designated as a bird sanctuary because of its importance to migratory songbirds and waterfowl. 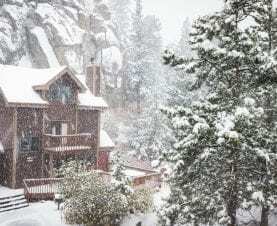 The Rocky Mountain Conservancy Field Institute offers classes where you can learn more about the natural world of Rocky Mountain National Park.